Seattle mayoral candidate Jenny Durkan offers more specifics than rival Cary Moon when it comes to explaining what new programs would cost and how to fund them. Moon says she’d push harder for a fairer tax system. Bold solutions, better services, new programs. Those are the plans candidates always tout, including this year’s contenders for Seattle mayor. But making good on such aims can be challenging in a city where taxing options are tightly constrained by state law and requirements to secure voter approval. 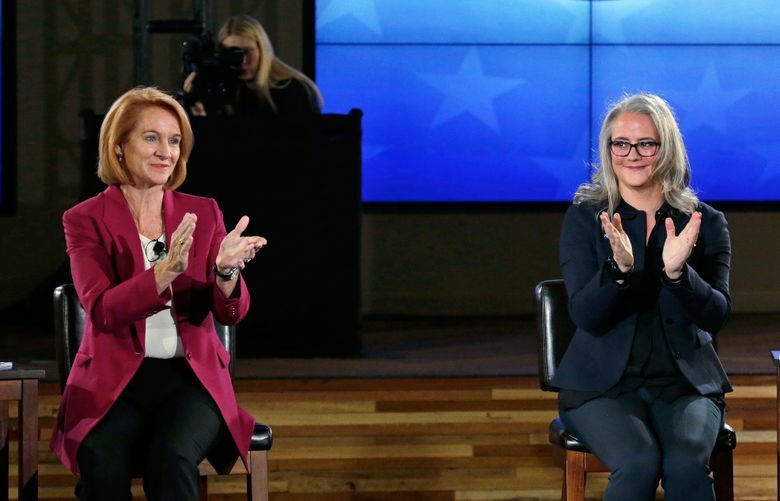 Jenny Durkan and Cary Moon both want to reduce homelessness, curb gentrification, improve the speed and ease of transportation and more, but with Tuesday’s election approaching, they continue to talk differently about how they would raise and spend money to achieve their goals. Durkan offers more specifics about the potential costs of her proposals, while acknowledging she may ask voters to tax themselves more. The former U.S. attorney is skeptical about winning a statewide capital-gains tax to help pay the city’s bills. “On the campaign trail it’s easy to promise everything to everyone, regardless of cost, but the truth is that mayors often have to make tough choices about how best to make progress on the problems the city faces,” Durkan said in a statement. Moon outlines few specifics about the costs of her ideas, saying that to do so would be premature and possibly misleading. Instead, the urbanist stresses she would target large businesses, real-estate speculation and capital gains with progressive taxes. Moon’s plans don’t include asking for new or larger property-tax levies. Durkan says she would first scrub Seattle’s budget for savings. She then might need to ask voters for more money for mental-health and addiction services, she says. Severe underfunding of such services has contributed to homelessness, Durkan says. She says she would work with King County on a regional approach. After then-Mayor Ed Murray scrapped a proposed property-tax hike for homeless services this year, he pledged to work instead with County Executive Dow Constantine to put a sales-tax hike on the 2018 ballot. Durkan could revisit that idea. Durkan says she also would consider a Seattle-only version of the sales-tax increase for arts and culture that county voters rejected this year. And she would look at asking for a larger Families and Education Levy when city voters decide whether to renew that property-tax stream next year, possibly combining it with a larger Seattle Preschool Program levy. She hasn’t named dollar amounts for those potential tax increases, saying she would examine each levyto try to keep from pushing low-income people out of the city. She says additional money from the education levy — until now aimed at K-12 students — could help pay for her plan to offer two years of free community college to every graduate of the city’s public schools, supplementing soda-tax revenue earmarked for college scholarships. Also for her college program, which she says would eventually cost $7 million a year, Durkan says she might try to tap a Sound Transit 3 local-education fund. Durkan has pricetags for other proposals. Building and maintaining 1,000 tiny houses for homeless people, she says, would cost $11 million next year, while rent vouchers for the 350 families on the Seattle Housing Authority’s Section 8 waitlist would cost $2.2 million. Durkan says the City Council should include money for the tiny houses and vouchers in the 2018 budget, but she doesn’t say where the dollars should be found. She says she would ask for Medicaid-waiver money to help pay for the tiny houses and for a rent-voucher program serving 8,400 households. That program would cost $13 million annually. Ramping it up to serve 23,000 households would cost $60 million. Higher fees on buyers when the city sells land and new landlord-license fees are possible revenue sources, she says. Durkan says she’d use $4 million not spent on building a new North Precinct police station to expand a diversion program for low-level drug and prostitution offenders. Some of her proposed revenue sources are murky. She says $1.4 million from savings related to “regional consolidation” of homeless services would allow her to create 700 new shelter beds in community centers and other existing buildings. The city should “repurpose” $1 million to expand child-care subsidies and should forgo $1.7 million in revenue to give tax breaks to small-business startups. Moon’s goals include quadrupling the amount of affordable housing in Seattle, adding more bus-only lanes, building out a complete network of protected bike lanes and opening more shelters that allow people to stay with partners and pets. Moon would try to create a public broadband system for Seattle and connects Durkan’s ambivalence on the issue to her support from Comcast. She also wants to expand shelters for domestic-violence victims, spend more money on mental-health and drug treatment and offer training in civics, organizing and advocacy to young leaders of color. Moon said the costs of her plans are yet to be determined. For example, the city is revamping how it spends on homeless services, with staff set to award money soon. “I will evaluate their methodology and identify which programs align with the values of getting people back into homes as quickly as possible,” she said. Moon has made progressive taxes key to her campaign, telling voters she would push for a statewide capital-gains tax on wealthy households, explore taxing speculative real-estate activities and change the city’s business tax to have small companies pay less and large companies pay more. She says approval from the state Legislature may be needed before capital gains can be taxed and says taxing real-estate speculation may be viable at the city level. Durkan says there’s no doubt a capital-gains tax would require approval from Olympia. This year, the city’s law department said Seattle lacks the legal authority to mimic Vancouver, B.C., in adopting taxes on foreign buyers and vacant homes. Moon says she would ask voters to renew the education and preschool levies at their existing levels. She says she would improve outcomes by reallocating dollars. Both candidates say they would lobby in Olympia to boost taxes on real-estate sales, which Moon would try to use for affordable housing and both have said they want to take a look at development-impact fees. Moon says she would also lobby state lawmakers to enlarge Washington’s housing trust fund. She wants to open more authorized homeless encampments and encourage philanthropists to contribute to community land trusts. She’d come up with some extra money by cutting the mayor’s office budget. If Seattle’s new income tax survives legal challenges, Durkan says she would use “a significant portion” of the revenue to reduce regressive taxes, a move Moon recently disagreed with. Both candidates say they’d seek property-tax exemptions in Olympia for seniors and try to make transit free for young people. Durkan says a major difference between the rivals is her numbers. “Jenny is the only candidate in the race who has outlined the potential costs of her proposals,” her campaign said, slamming Moon for relying too much on changes unlikely to win approval from state lawmakers. She says she’ll press the Legislature for a progressive capital-gains tax, but her conversations with Seattle lawmakers have convinced her that will be an uphill battle. Moon says Durkan’s numbers won’t add up without taking money from existing programs and says a difference is her commitment to fight for fairness. The candidate says her plans lack detail at the moment because she favors a collaborative approach. She says she would work close with the city’s economists, lawyers and policy experts and with community leaders to identify the best answers.